Fake news is one of the more troubling trends of 2017. The term is liberally applied to discredit everything, from stories with perceived bias through to ‘alternative facts’ and downright lies. It has a warping effect on public opinion and spreads misinformation. Fake news is nothing new – bad journalism and propaganda have always existed – but what is new is its ability to spread through social media. In this post, we’ll see how graph analysis and visualization techniques can help social networking sites stop the spread of fake news. We’ll see how, like fraud, fake news detection is about understanding networks. We’ll discuss how Neo4j and the KeyLines graph visualization toolkit can power a comprehensive fake news detection process. A quick note: For simplicity, in this post we’ll limit the term ‘fake news’ to describe completely fictitious and unsubstantiated articles (see examples like PizzaGate and the Ohio lost votes story). How Is Fake News a Graph Problem? To detect fake news, it’s essential to understand how it spreads online – between accounts, posts, pages, timestamps, IP addresses, websites, etc. 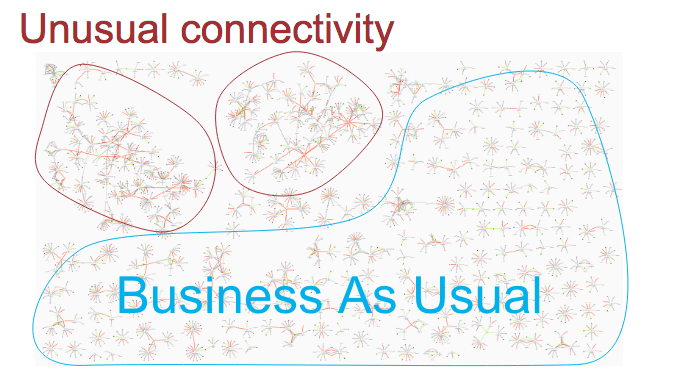 Once we model these connections as a graph, we can differentiate between normal behaviors and abnormal activity where fake content could be shared. Fake news spreaders are just as determined as regular fraudsters. They’ll adapt their behavior to avoid detection, and employ bots to run brute-force attacks. This uses a Neo4j graph database as the engine for an automated, rule-based detection process. It isolates posts and accounts that match patterns of behavior previously associated with fake news (‘known fraud’). 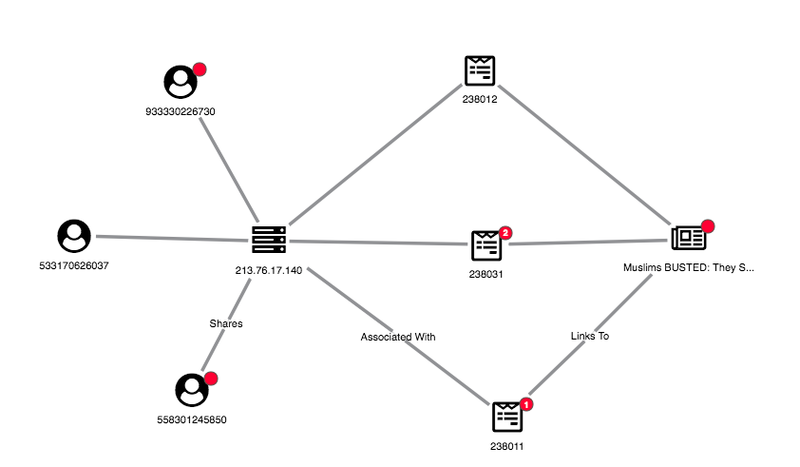 At the same time, a manual investigation process, powered by a KeyLines graph visualization tool, helps uncover new behaviors (‘unknown fraud’). 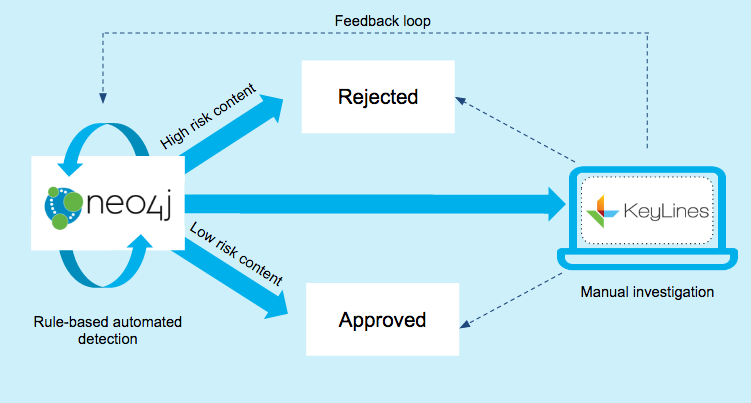 New behaviors are fed back into the automated process, so automated detection rules can adapt and become more sophisticated. Once we’ve created our data store, we can run complex queries to detect high-risk content and accounts. Here’s where graph databases like Neo4j offer huge advantages over traditional SQL or relational databases. Queries that could take hours now take seconds and can be expressed using intuitive and clean Cypher queries. 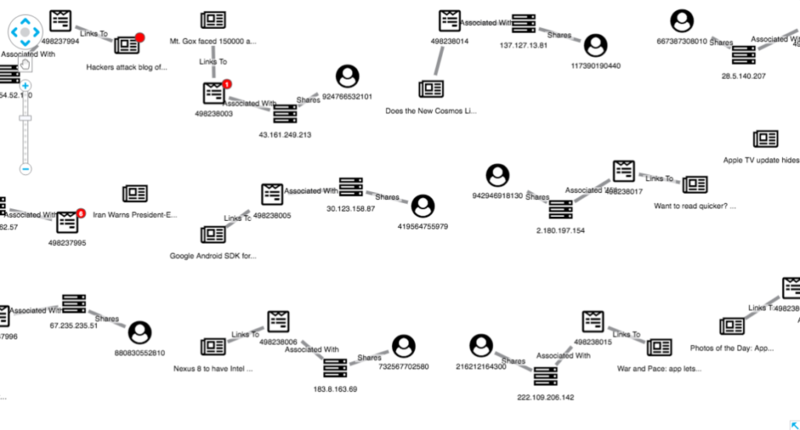 To seek out ‘unknown fraud’ – cases that follow patterns that can’t be fully defined yet – our manual investigation process looks for anomalous connections. A graph data visualization tool like KeyLines is essential for this. Let’s define a visual graph model so we can start to load data from Neo4j into KeyLines. It’s not a great idea to load every node and link in our source data. Instead we should focus on the minimal viable elements that tell the story, and then add other properties as tooltips or nodes later. To find anomalies, we need to define normal behavior. 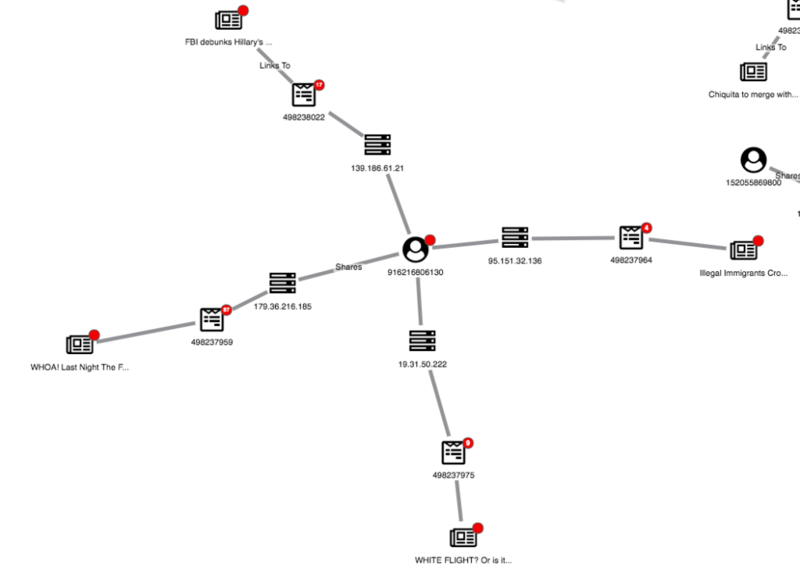 Graph visualization is the simplest way to do this. Normal posts look similar to our data model – featuring an account, IP, post and article. Popular posts may be attached to many accounts, each with their own IP, but generally this linear graph with no red glyphs indicates a low-risk post. Other structures in the graph stand out as unusual. Let’s take a look at some examples. We can see one article has been shared multiple times, seemingly by three accounts with the same IP address. By expanding both the IP and article nodes, we can get a full view of the accounts associated with the link farm. This post is just an illustration of how you can use graph visualization techniques to understand the complex connected data associated with social media. We’ve used simplified data and examples to show how graph analysis could become part of the crackdown on fake news. We’d love to see how this approach works using real-world data. Catch my lightning talk or stop by our table at GraphConnect on 11th May to see how we could work together! Cambridge Intelligence is a Silver sponsor of GraphConnect Europe. Use discount code CAMBRIDGE30 to get 30% off your tickets and trainings. Join us at the Europe's premier graph technology event: Get your ticket to GraphConnect Europe and we'll see you on 11th May 2017 at the QEII Centre in downtown London! 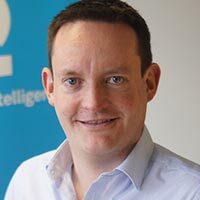 Dan Williams works closely with Cambridge Intelligence customers who are building advanced graph applications, helping them to make the best possible graph visualization tools. He has a Master’s in Physics from Oxford University and a wealth of experience with a variety of software products across many different industry verticals.